Sky Force 2014 Android mobile app is for the new version of the IGN-developed Sky Force 2004. Infinite Dreams re-launched the game to mark its 10th year anniversary as an excellent battle game choice, by releasing a free to download Sky Force game app at the Google Play Store. Presented with the same island backdrop, a top-down shooter engages in fierce battles against fighter enemy jets and warships, whilst trying to rescue survivors stranded in several small islands. The new battles present tougher challenges to hurdle and complete, with more enemy fighter jets, warships, attack helicopters, and multiple Boss battles that make rescuing the survivors more difficult to achieve. The new Sky Force 2014 version has nine (9) stages in all, each having a different set of missions to complete. A player though, has to pass the earlier Stage Levels first, starting with Stage 1. 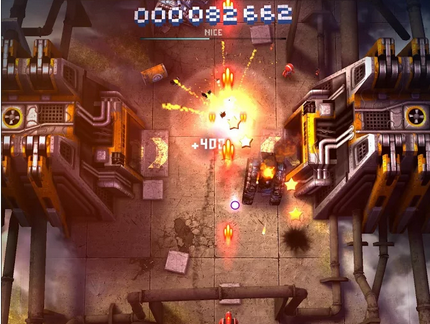 Sky Force fighters must destroy at least seventy percent (70%) of the enemy forces, whether air or water borne, as well as rescue people in order to pass the Stage level. Destroying 100 percent, (100 %) is a better percentage rate, in order to unlock any Stage Bonus Game. Earning as many battle stars as one can muster increases a player’s game score. The Battle Stars collected from undertaking each Sky Force mission, whether one succeeded or failed in completing the tasks, can be used for replenishing health, or buy power ups for the jet, its cannons, and other weapons such as homing missiles, laser power, and mega bombs. Power ups also include Energy Shield and a Magnet; the former reinforces Sky Force fighters’ defenses during battle, while the latter has magnetic forces that empower players to collect the medals and stars effortlessly. The greater the number of stars collected and appearing in one’s Hangar, the more intense the firepower that can be added to a Sky Force Jet. Upgrades include increasing the intensity and rate by which weapons can inflict damage to enemies. The greater improvement to the Sky Force 2014 game as spinoff of the 2004 original is the social gaming elements provided by the game app. Players can connect to their Facebook account and engage in competition with one’s circle of FB Friends. Through FB, they have the capability to rescue or be rescued in failed missions, by sending or receiving stars that enable players to buy health. Sky Force players can register their game and be included in the Leader Board. More importantly, a registering player receives 250 Battle Stars as bonus comps for doing so. Aside from the language, music, sound volume and brightness settings, a player has option for game controls. One can choose to navigate by keeping a finger pressed on the Sky Force jet in order to attack and slide away; or to choose the option that allows placing a finger, pressed near the Sky Force jet, in order to keep a clear vision of one’s position during battle while attacking and dodging missiles. Sky Force has always been an excellent game to start with, and Infinite Dreams’ Android mobile app for the new Sky Force 2014, meets if not surpasses, all high expectations about the enhancements that make a Sky Force 2014 battle game even more gripping and immersive. The app succeeds in delivering excellent 3D graphics and all game features and requirements, by way of clear menus and quick response actions to control executions.